If you want to grow the best-tasting apple in the world, this is probably it. This unassuming apple has perhaps the most remarkable flavour of any variety. "Undoubtedly the best tasting variety we grow …"
"Rubinettes are, by far, the tastiest apples I have ever eaten." "... the most delicious apple I have had in years." " ... a wonderful little apple." "Crisp-juicy-flavoursome-tart - the most tasty apple we have had for years." "... by far the tastiest apple variety I've tried in a long time." "Extreme summer heat did not bother it and the flavor and crunch were outstanding." "... the best apples I have eaten." "... spent a couple of hours tasting a huge variety of apples, and we all kept coming back to Rubinette." 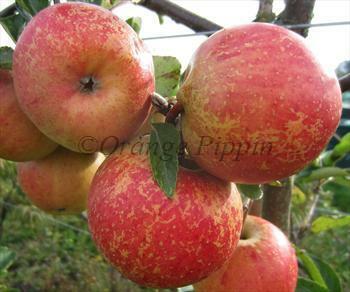 "This apple is a revelation ..."
Rubinette is related to Cox's Orange Pippin, and has a very similar style and flavour. It is perhaps the only variety that could legitimately claim to surpass Cox for the richness and balance of its flavours. We offer the "Rubinette Rosso" sport, which has a slightly better skin colouration. Please fill in the details below and we will let you know when Rubinette Rosso apple trees are back in stock. Denser and crisper than Rubinette, but worth considering if excellence of flavour is your main requirement. Rubinette Rosso is in flowering group 3. Rubinette Rosso is self-sterile and needs to be pollinated by another tree of a different variety nearby. Since it flowers in the middle of the blossom season it can be pollinated by most other apple trees. The main issue to be aware of is that if left to its own devices Rubinette has a tendency to produce under-sized apples. The solution is to thin the fruitlets in late spring just after the blossom finishes - allow no more than 1 fruit per set of blossoms. An unusual feature of Rubinette is that fruit size usually improves as the tree gets older, with good size being achieved about 3 years after planting. Rubinette can be grown with some success without any chemical treatments (we do ourselves) but if you are in a wetter climate then spraying against scab (using either conventional or organic pesticides) should give better results. Keep the ground around the tree free from grass and use a mulch to suppress weeds. Religiously clear up all old fruit and fruitlets to deny pests and diseases a home over winter. Rubinette is a good choice for apple enthusiasts in warmer areas of Europe who have not been able to achieve satisfactory results growing Cox's Orange Pippin. Rubinette performs much better than Cox in warmer climates, such as southern France and Spain. However it is equally at home in cooler temperate climates and can be grown anywhere that Cox can be grown. Most growers also find that Rubinette maintains a consistently high quality flavor every year, regardless of the weather. Rubinette was developed in the mid-20th century by Walter Hauenstein, a grower from Rafz in Switzerland (hence it is sometimes known as Rafzubin). It is a marriage of two of the world's greatest apple varieties - Cox's Orange Pippin and Golden Delicious. Ironically, Hauenstein was intending to raise an "improved" Golden Delicious, but as it turned out Rubinette inherited almost all its characteristics from Cox's Orange Pippin. Enthusiasts may frown on the presence of Golden Delicious, but somehow it is the one-dimensional rich sweetness of Golden Delicious (or perhaps its spicier parent, Grimes Golden) that lifts and draws out the subtle flavours of Cox. It is certainly a marriage that works, and anyone interested in the flavours of apples will surely want to grow Rubinette. Rubinette Rosso is a sport of the original variety, with more prominent red coloration, but the same flavour and growth characteristics.